The Clay Haus is an old German House, symbolizing a segment of the heritage of Somerset, Ohio. The original deed (displayed in the Clay Room) describes Jacob Miller (he was of German decent) selling the house to Phillip Grelle in 1812. The village of Somerset was then called Middletown in Fairfield County. This property was then sold to Frederich Mains, a tinsmith, which may attribute to half of the lower level being filled with ash and in a somewhat charred condition at the time of our renovation. Mr. Mains sold the house to Jesse Morris, a doctor. 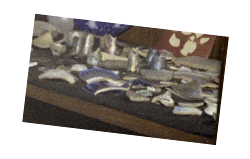 In excavating the bottom level of the house, many broken bottles were found, one still in tact. Dr. Morris sold the house to George Jackson in 1834, the builder of the Somerset Court House. The house stayed in the Jackson family name for several generations. William Jackson, a musician, owned it in 1850 and is remembered for his fife playing in the Memorial Day Parades. Artifacts found during the reconstruction and renovation of the Clay Haus date prior to 1899's through 1900's. We feel the Tavern Room (lower level) was originally the living area. Iron fixtures can still be seen in the cooking fireplace. An open entryway in this room faced the main street, this was believed to be the main entrance used by the family. The windows were originally eye level with the street, as there is a distinct transition from sandstone to paving brick at the window level on the outside stairway wall. This theory is supported by the fact that the road from Rushville was so bad that travelers were exhausted when they finally arrived in Middletown (Somerset). When this road was finally improved we believe our outside entrance had to be bricked up to level the road. This has remained in tact over the years. 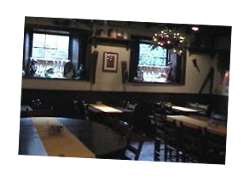 As you sit by our hearths on a cold winter night, we hope you are enjoying dining at the Clay Haus with fine American and German cuisine.